This is the final part of our tutorial on debugging. In this part, we will show how to debug the overloaded-advices example step by step. This example comes bundled with JBoss AOP release, so all you need to do is to download the 2.0.0.GA release and start following the next steps. 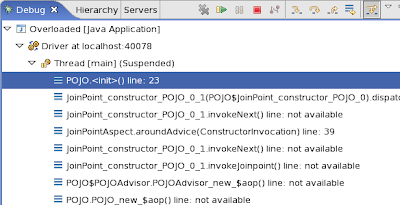 First, create a project for the overloaded-advices tutorial example using Eclipse (the URL location is jboss-aop-2.0.0.GA/docs/aspect-framework/examples/overloaded-advices) and solve classpath issues by adding the JBoss AOP jars to the classpath (just include the jars of the jboss-aop-2.0.0.GA/lib directory). Configure a Java Application execution to run the Driver class, setting the AOP arguments as has been showed in the first part of this tutorial. 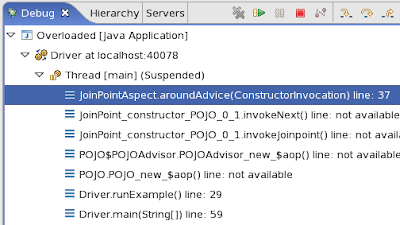 You see that the previous step resulted in a stack trace that shows a wrapper method belonging to the POJO class: POJO.POJO_new_$aop(), followed by the wrapper that is our focus of interest, the one belonging to the Advisor class: POJO$POJOAdvisor.POJOAdvisor_new_$aop(). Oh no! Another “noise”. This time, more code handling locks. Now you know what to do. Press F7, return to the wrapper method, and press F5 on this wrapper until you enter a new block of code. Continue this process until you have finally entered the Joinpoint class. Note that the second “noise” (ConstructorInfo.hasAdvices()) will appear twice in a row. At this point, you have reached the joinpoint being intercepted. Whether it is a method or constructor, you can debug it as if this was a normal Java application. If it is a field set or a field get, you are not going to be able of debugging it though. But you can check the new value of the field after a field set joinpoint once you get back to your normal application at step 13. Pressing F5 now does not take us to the next advice,as all advice have already run. It takes us back to the advisor wrapper method. You are done! Just press F7 twice to exit both wrappers and go back to the driver class. Now you can continue debugging. 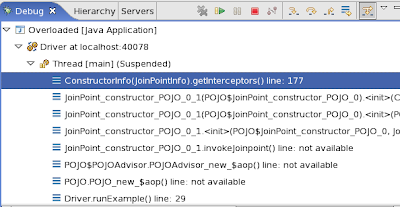 Try to enter the next joinpoints of the overloaded-advices example to see the other advice running! Remember that you must press F5 on field read and field write joinpoints, in order to enter their wrapper method code. Once you have walked-through the steps to debug the overloaded-advices example, you are ready to debug any other JBoss AOP application you like. Try doing so using a different JBoss AOP tutorial, or just try debugging your own JBoss AOP application. 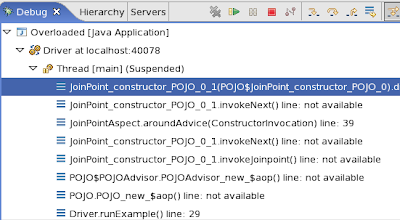 The next time you need to debug an application that uses JBoss AOP, I hope it is going to be easier for you to track bugs down with the tips we have presented in this tutorial. Good luck!